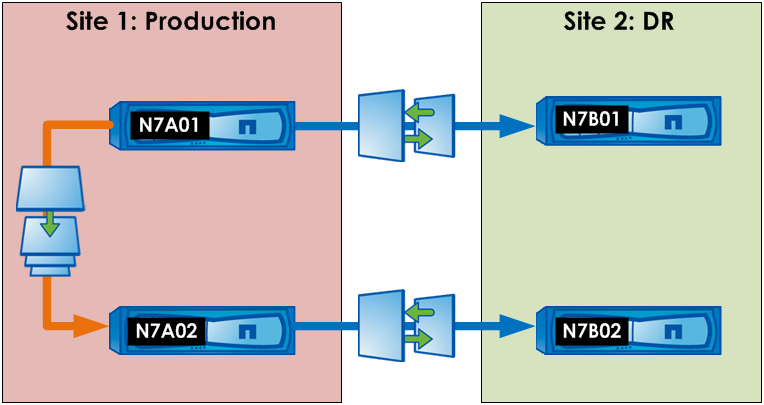 In the following blog post, we run through the steps to setup a Data ONTAP 7-Mode SnapMirror-ed Production and DR setup, additionally with a SnapVault of the primary volume at the local site, and further mirror the volume with the SnapVaults to a DR site. In the lab, I have two sites - A and B - with the below named 7-Mode systems. We will create 3 volumes on the Production controller (N7A01) that we want to protect. Note: The version of Data ONTAP 8 (Operating in 7-Mode) used in the lab is 8.1.2P4. Here we create volumes; restrict volumes where they will be VSM (Volume SnapMirror) destinations; and disable the SnapShot schedule on the primary and secondary SnapVault volumes, since we’ll be using SnapVault snap sched to manage our SnapShots. Note: SnapVault in 7-Mode uses the Qtree SnapMirror engine (QSM) - this gives the option of a volume fan-in relationship. Here we take all 3 source volumes and SnapVault them into our one Vault volume. This step optional, you can let your external DNS handle this (if configured). Here we setup the SnapVault from N7A01 to N7A02. N7A01 keeps 7 (bi) hourly snapshots, 6 nightly and 2 weekly. N7A02 also keeps 7 (bi) hourly snapshots, then 12 nightly and 5 weekly. Here we first SnapMirror the production data on N7A01 to DR and N7B01 - we SnapMirror hourly at 30 past the hour. And then we setup SnapMirrors of the SnapVault-ed data on N7A02 to DR SnapVault - N7B02.